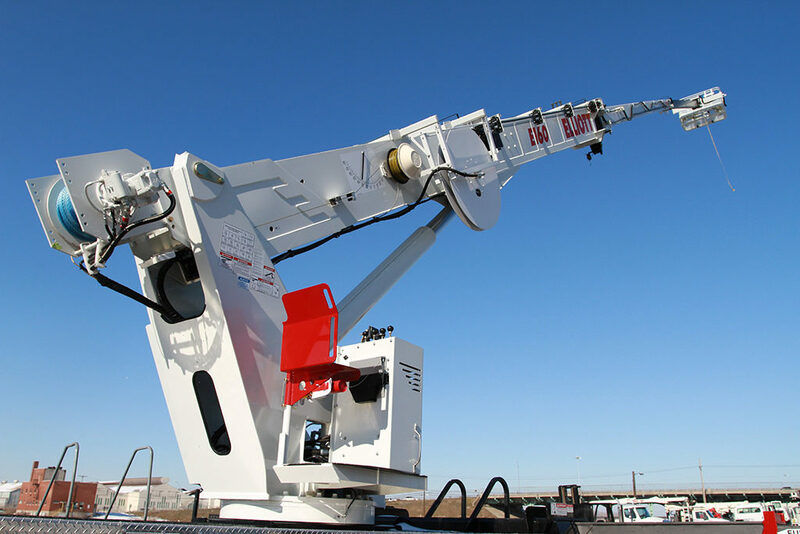 Setup and teardown are facilitated by EZ-crib outriggers with two-state vertical stroke, offering the utmost in ground penetration. The hydraulic lift system of the 3’ x 6’ gravity-leveled work platform makes it possible for one man to connect the platform yoke to the boom tip or jib. These are just some of the features included with the tallest aerial lift from Elliott. Other attributes include a lifetime structural warranty, heavy duty cable carrier, Dynasmooth controls, full-length subframe construction (for unmatched stability on a variety of surfaces and working conditions), rugged boom design, and much more. With Elliott’s tallest aerial lift to date, everything is within reach – including job performance you never thought possible! The Elliott E160/215 is an ideal aerial lift to handle a broad assortment of jobs that require exceptional height without compromising stability. While some aerial lifts are limited in total reach and extension, the Elliott E160/215 brings you the advantages of the tallest aerial lift in the world – all backed by one of the most reputable names in the aerial lift industry. What types of jobs is the Elliott E160/215 designed for? – Construction work. Indoor, outdoors and elsewhere, no other lift rivals this Elliott model for on-the-job capability. – Roadway work and repair. The E160/215 is perfect for high overpasses and other hard to access areas. – Tree removal and landscaping. With its oversized work platform and ultra-rugged design, the E160/215 isn’t just the tallest aerial lift; it’s also the most versatile, too! – Painting. From water towers to large equipment, it helps to have the tallest aerial lift on hand to handle those tough tasks. Without the Elliott lift, jobs that were formerly impossible are now totally doable. – Window cleaning/glazing. Many companies use the Elliott E160/215 to handle window cleaning and other maintenance jobs that require exceptional extension. Aerial work platforms are generally used for short-term applications such as construction and maintenance work. They are also used by firefighters for emergency access. They are designed to lift weights that are usually less than a ton, which the E160/215 now exceeds by 20 percent. Aerial work platforms, or cherry pickers, may also be equipped with compressed air connectors or electrical outlets to enable the use of power tools. With the tallest aerial lift available for commercial use, Elliott has once again raised the bar (actually, to 215 feet exactly!) for aerial lift performance, reliability, and durability. If your company requires a little extra boost to get the job done right – the first time, every time – the Elliott E160 line of aerial lifts offers everything you’re looking for in an aerial lift or boom lift. The Elliott Equipment Company literally invented the aerial work platform. In 1948, Richard Elliott invented the first-ever telescoping, truck-mounted crane and aerial work platform. Using only the best components available, he traveled coast to coast from city to city, building just one rig at a time. The multi-functional appeal of his device quickly caught on and before long, Elliott’s machines were being adapted for mining, installing commercial signage and a host of other applications. The company’s mission is to create the best solutions for positioning people and lifting loads. 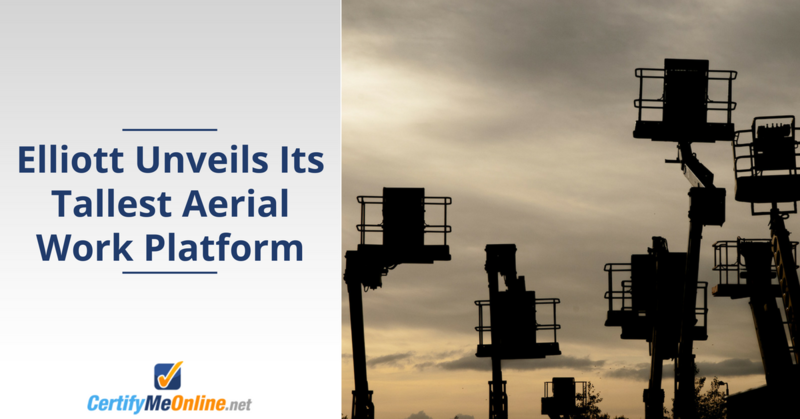 The company now has more than 40 different models of work platforms and cranes used in ports, mining, construction, transportation, utilities, anywhere that a long-tall reach is needed to get the job done. With CertifyMeOnline.net, we’ll handle all of your aerial lift and scissor lift training needs. From the soaring Elliott E160/215 aerial lift to the smallest scissor lift, you’ll have the latest OSHA-approved training right at your fingertips! We have three basic aerial lift training package. We offer a Train the Trainer certification, Aerial Lift and Scissor Lift training, and our popular Fall Protection course. Best of all, CMO’s flexible and affordable training is ideal for both employers and employees. Since every employer in the U.S. is required to offer their workers training, CMO is the ideal “one-stop shop” for all your OSHA certification requirements. Plus, our courses offer individual employees outstanding leverage for their aerial lift and scissor lift careers. Since our training travels with you and it good for three years, you’ll have the best possible chance to get the job you want – even if you’re looking to operate the tallest aerial lift – the Elliott E160/215! For more information, please visit our pricing page, or give our OSHA aerial lift experts a call at (602) 277-0615. This post was originally published in 2013. It has been updated as of 2018 to include more features and functionalities of Elliott’s tallest aerial lift. This entry was posted in Aerial Lift Training on October 22, 2013 by admin.